There has been two things that I’ve always wanted to give a go but never thought I’d have the opportunity to. 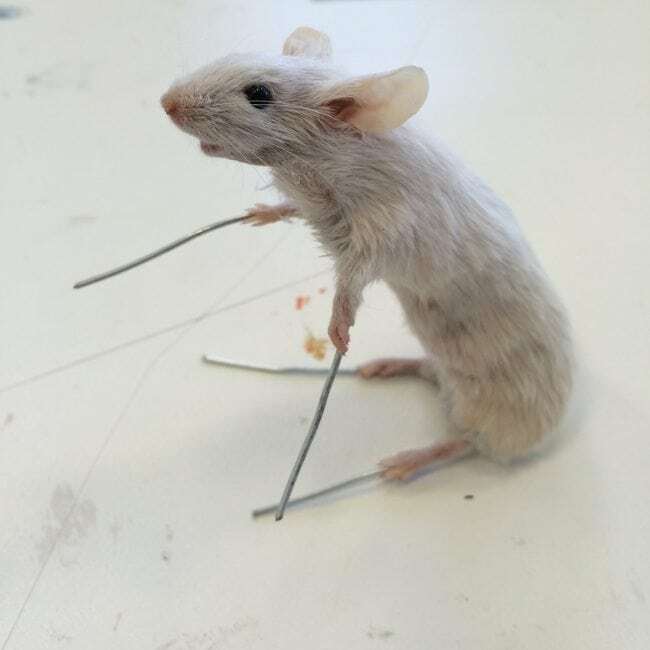 One being to join the circus or attend Circus School (which, by the way, is a real thing, and it’s in London), and the other was to try my hand at taxidermy. Being mostly vegetarian (I don’t enjoy the taste / texture of meat), this weird obsession of mine has most of my friends and family baffled. What can I say, I’m a bit of a curious creep, and I don’t really give a damn. I find taxidermy fascinating and I love stuffed birds and small creatures. My grandad had a mounted moose head which gave me the heebie jeebies when I was a kid, so I draw the line at the bigger ones. . . although I do love a good stag – don’t we all? 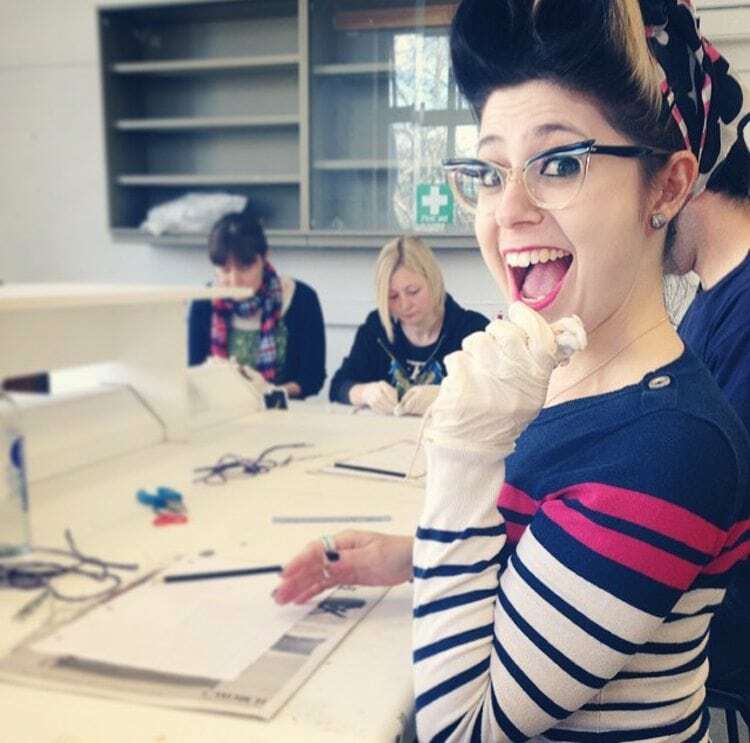 When Harriet mentioned she had a ticket to go to Margot Magpie’s Taxidermy Workshop during the Edinburgh Science Festival I couldn’t believe my ears. I’ve been a fan of Margot’s incredible work for years and I never knew she would be taking her shop on the road to my town. She’s been running classes in London for years and is a total pro, making this one hot ticket! Now, I know what you’re thinking. One hot ticket? REALLY VICKY? Well yes, actually! Her classes are always sold out. Quite a lot of people are closet taxidermy enthusiasts and actually have the guts to give it a go *pun intended* And despite what you think, there was actually very little blood and minimum gore, just a whole lot of fascinating things to see. Personally, I think it’s funny how people are so repulsed by the idea. The animals are not killed for the process. Once they’ve died they’re really just a shell. There are then three things that can happen; you bury it, you eat it, or you turn it into something else. I’m 100% against animal cruelty and real fur coats etc, but that’s a very different ball park to this; those animals suffered for human’s gratification. These ones are just being recycled. Having a degree in fine art, I guess I’ve always been taught to find the beauty in everything; the idea of preservation through sculpture, photography and illustration is a big part of life. The way I see it is that this is just a more traditional way of preservation. At school, children are handed frogs to dissect in class to learn about biology. But what happens to the frog afterwards? Bin, right? But with taxidermy you can learn all the intrinsic details of the inner workings of the creature and not have it’s life go to waste. If they were wiser, they’d bring taxidermy class into high school. Well, I know I wouldn’t have bunked off that day! This is my mouse! That is paint on the table by the way. And the wires are to help shape his posture, but they’ll be clipped down once he’s cured. It might sound strange to you, but as soon as you start working you actually loose all sight of the gross-ness of what you’re doing. As you have to give it all your concentration and you’re working so carefully and delicately, you forget that you’re holding a creature. It becomes a fascinating being, not one that is frightening or disgusting. Now I have a better idea of what surgeons do; they don’t get thrown by the fact you’re a patient with family and kids and such, they focus 100% on the job at hand, switching off to the world outside the part they’re working on. That’s really incredible. 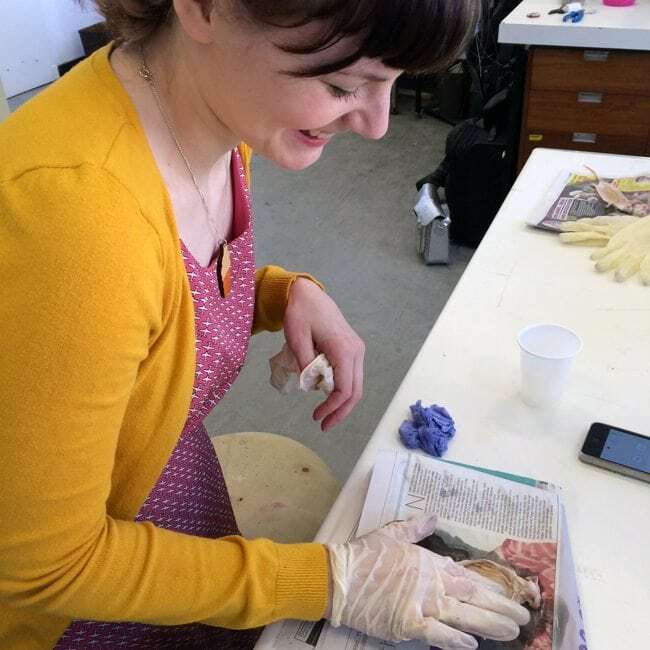 So, not only have I learned what the insides of a mouse looks like, but I’ve also learned a great new skill and have developed a new level of understanding and respect for those who do this for a living (whether that’s taxidermy or surgery). In a 4 hour class, that is incredible! 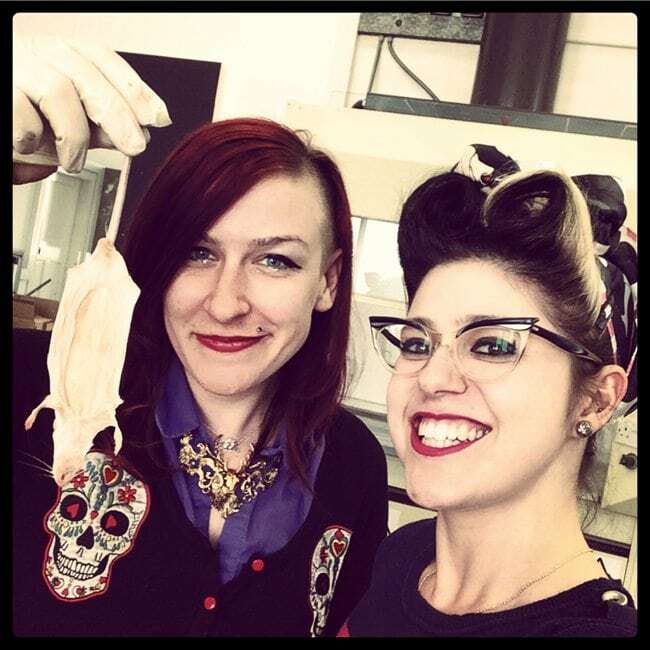 So for any of you who are curious, I definitely recommend giving Taxidermy Class a go. Margot is a really great teacher and has such vast knowledge on the subject and of the inner workings of the mouse that they’re is no way you’re going to walk away disappointed by the day. 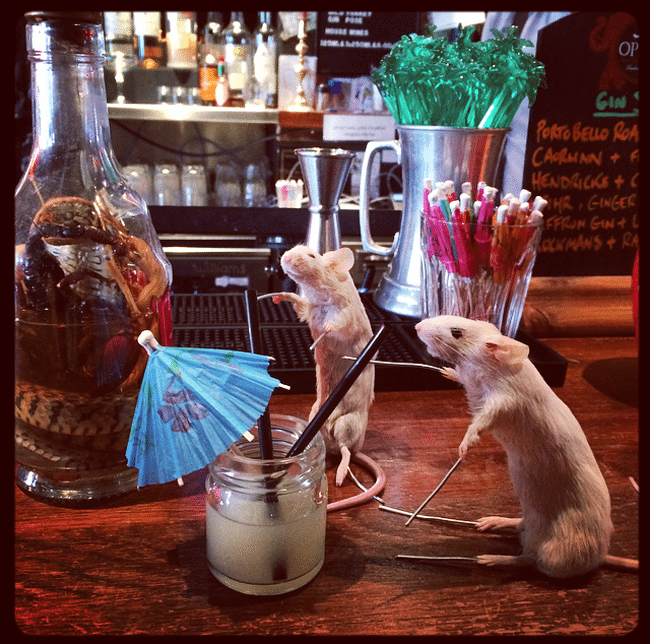 In just a few hours, Harriet and my mice had gone from popsicles to total bar rats. If that doesn’t blow your mind I don’t know what will! If you want to give it a go at home, you can buy starter kits with books, chemicals and everything you need from A Field Guide FIY: Animals are not included, but you can find frozen mice at pet stores and save them from a snake’s dinner. Failing that, if you find any animals that have died from natural causes you can give them a new life. I think Harriet and I have found our new calling!